Convert MOD to MP4, MKV, AVI, WMV, and other 1,000+ video formats without losing quality. Edit MOD videos before converting with trimming, cropping, rotating, adding watermarks, apply effects, etc. Compress MOD file size by changing video resolution, customize bit rate, select quality, and others. Versatile toolbox combines Video Download, GIF Maker, Fix Media Metadata, Burn DVD, etc. If you record a video clip using your video camera, it will be saved as a .MOD file extension. MOD files are MPEG Files but with a MOD file extension. Depending on how you record your video clip, you can easily rename it from the MOD file extension to MPG playable on your PC. However, if the file has an aspect ratio of 4:3, you will be required to use a conversion tools to change it to MP4 format. Converting MOD files to MP4 makes it easy for you to share the captured memories online as MP4 files are highly compressed and compatible with most devices. If you are in this dilemma, this article will introduce you best and free ways to convert MOD to MP4 without effort. MOD to MP4 conversion is a simple process. 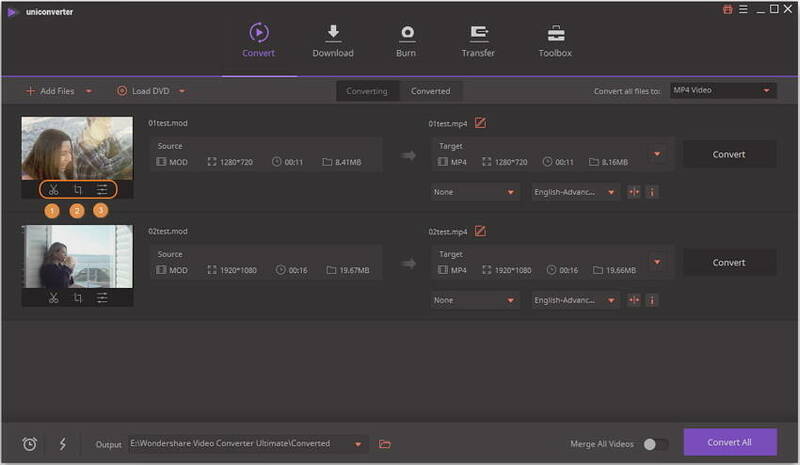 Upon launching Wondershare UniConverter (originally Wondershare Video Converter Ultimate), you can simply know the process to convert and edit the MOD video files. 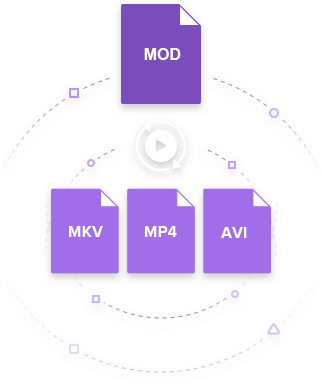 There are several reasons why you would consider converting MOD to MP4 format. For instance, if you are running on Mac, iPhone, or iPad, the standard format for video files in the MP4. Wondershare MOD converter is what can help you do the converting process with super fast speed and high quality output. It supports both Mac and Windows system, you can convert MOD to MP4 and other 1,000+ video formats easily. Here is a list of features that make Wondershare UniConverter a favorite amongst all users and professionals. Directly convert MOD to MP4, VOB (DVD-Video ), AVI, MKV, MOV and other 1000 formats. Burn MOD to DVD and Blu-ray disc to play with your DVD player. Convert video to optimized preset for almost all of the devices, like iPhone, iPad. Download videos/playlist from YouTube and other 10,000+ video sharing sites. 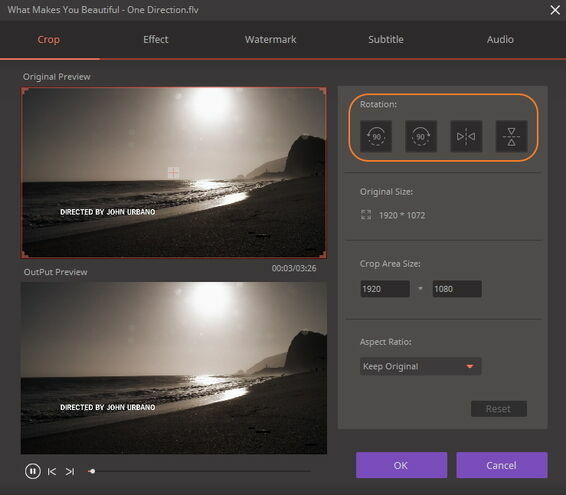 Versatile toolbox includes fixing video metadata, GIF maker, casting video to TV, Video compression, and screen recorder. Step 1 Launch the MOD converter and select the MOD files. First you have to download and install the Wondershare UniConverter and launch it. Then click on the Add File button to select the MOD files you want to convert and add them to the application. Alternatively, you can also open your video file via File Explorer and directly drag and drop file to Wondershare UniConverter. Note: Wondershare UniConverter supports batch conversions and you can load several files once. Step 2 Select output file format MP4. From drop-down list click Video category. And select MP4 as the desired output video format. You can see detail about the resolution, encoder etc. At this point, you can also make changes to the audio and video parameters as you wish. Some alterations you can make include video bit rates, resolution, frame rate, video quality, and aspect ratio among others. Sometime we rotate our camcorder to cover background or other reasons. When we play such home videos on TV or computer, it plays as rotated screen. To overcome such issues, we need to edit it before convert it. Open the edit tool. Here you can perform multiple editing task like trimming, cropping, applying effects, adding watermarks etc. But now we will rotate the video screen. Step 4 Start converting MOD to MP4. Click on the Convert All button to start the conversions from MOD to MP4. The process will be finished within a few seconds up to your video length. Wondershare Free Video Converter is the best free video converter for MOD to MP4 videos. 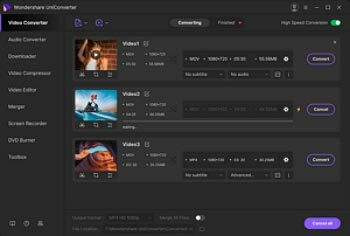 This can help you convert and edit your camcorder files for free with it user-friendly interface. Furthermore, Wondershare Free Video Converter has some other qualities too. 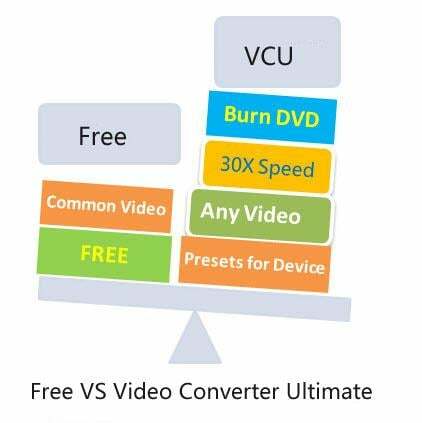 Wondershare Free Video Converter provides you with a one stop DVD video conversion solution enabling you burn DVDs, convert your MOD videos to major video formats as well as burn them to DVDs. Convert you MOD to MP4 files or to any other major format playable on your devices easily and effectively without compromising on its quality. Edit your files before converting them by adjusting, cropping, adding subtitles, merging, among many other options. Configure the output profile for every media player using the presets. You do not need any technical know how to use the application. Here is short description about how to convert MOD to MP4 free with Wondershare Free Video Converter. 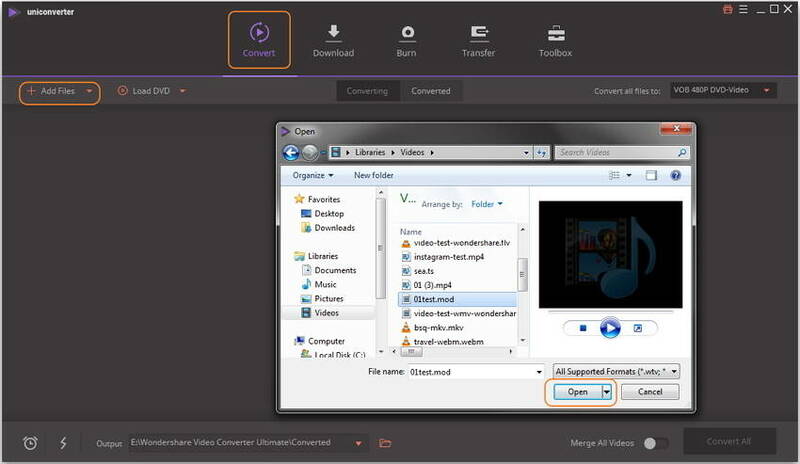 Step 1: Run Wondershare Free Video Converter, and click on the Add Files button under the Convert tab to add MOD videos you want to convert. 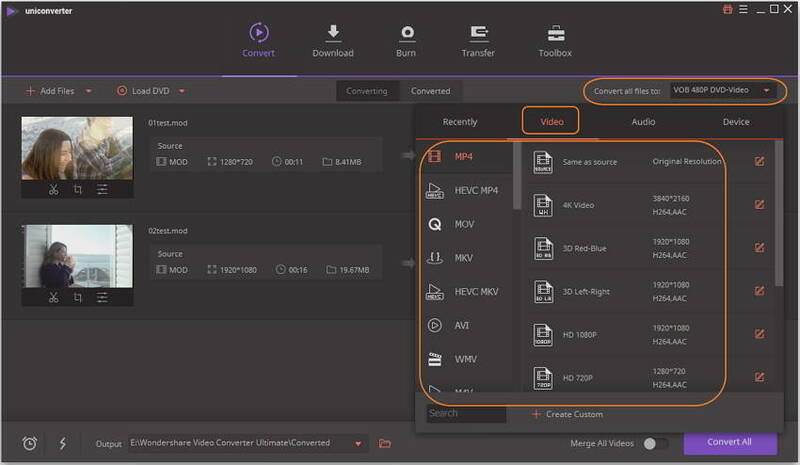 Step 2: Choose MP4 as output format by clicking the Convert all files to: option and choose Video tab to select your output formats. Step 3: Click the Convert All button to start converting your MOD files to MP4 for free after a few minutes. 1. What is MOD file? MOD is a video file extension created by Panasonic and JVC as the standard format when recording with a tape less camcorder. MOD video format is common in both Panasonic and Canon cameras. The MOD files are recorded on the SD memory cards and hard disks of the camera. The format can be compared to MPEG2, HDV, EX, XDMCAM. However, MOD extensions are still commonly used in some digital video cameras. 2. How to play MOD on Windows and Mac? Any PC or video player that supports MPEG-2 can easily view MOD files. MOD files can also be easily viewed using a DVD player due to the DVD-video standard compliance. If you want to share the captured files with your friends online, you will have to convert them to MP4 video format. Downloadable free to use conversion tool can easily hep you convert MOD to MP4 format which is the standard format for online streaming and is playable on most devices. You may also opt to convert the files online with free to use conversion utilities which do not require you to install them on your PC, such as Online UniConverter (originally Media.io).